Q: Can i download Spotify songs i like as mp3 and play them anywhere? (Without the actual spotify software, for example in my car). Is there DRM or anything like that? Will they work on my car radio (usb stick)? As a Spotify member, sometimes you may have similar problems: 'can I get MP3 from my Spotify Music playlist? How can I download Spotify songs to MP3?' Spotify can provide a huge songs you want to play, but there are still quite a lot of devices don't support it. And MP3 is the most perfect lossy audio format, which can be played on common MP3 players, iPod and other media devices. In that case, many users would like to find a solution to get MP3 from Spotify Music. In the following article, we will introduce the most efficient method to help you convert Spotify tracks and playlists to MP3 permanently. Spotify is one of the most popular streaming music services now. It allows you to enjoy millions of songs, podcasts and videos by simply signing up using an email address or by connecting with Facebook. And with Premium account, users can stream tracks inside the Spotify applications for offline listening. 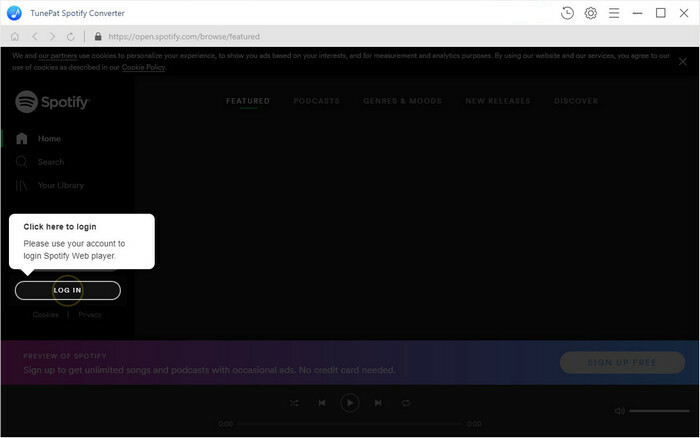 However, the Spotify offline content is essentially a cached stream, and not individually stored songs, that means you don't really own the music. What was worse, when the Spotify songs are downloaded, they are Ogg Vorbis format encrypted by DRM protection. Owing to DRM, you are not allowed to play Spotify songs without Spotify client, not to speak of converting Spotify music to MP3! 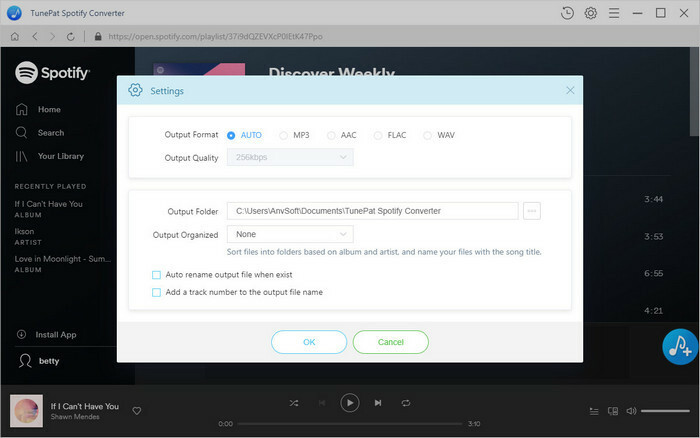 Here we recommend a stable and powerful, yet simple Spotify to MP3 converting software - TunePat Spotify Converter for you. Unlike other Spotify Converter, with TunePat Spotify Converter, you don't need install Spotify application on your computer. It can help you to convert Spotify tracks and playlists to MP3 at up to 10x faster speed and ID3 tags kept. 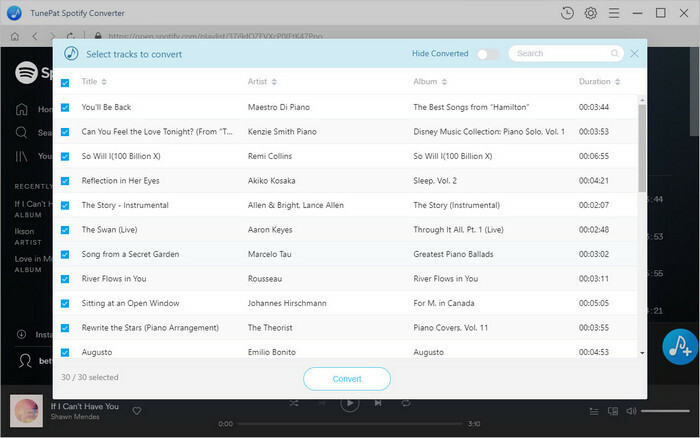 Convert Spotify tracks, playlist and albums to MP3, AAC, FLAC or WAV. Preserve 100% original sound quality; Keep ID3 Tags. Fast conversion speed; Simple and innovative user interface. Now the following tutorial will guide you how to convert Spotify Music songs to MP3 with TunePat Spotify Converter. Before started, download the latest version of the TunePat Converter on your computer. 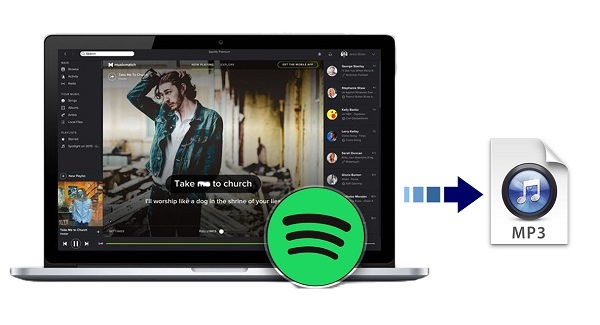 Install and Launch TunePat Spotify Converter on the PC/ Mac, then log in your Spotify account. On the bottom right corner of TunePat, you can click Settings button on the toolbar to adjust output parameters, including Output format, Output quality, Output Folder, etc. Here you can choose format as MP3, AAC, FLAC or WAV and adjust output quality up to 320 kbps. Browse songs in playlist, Album or Artist. The Add button will automatically appear on the toolbar once the songs can be added for conversion. 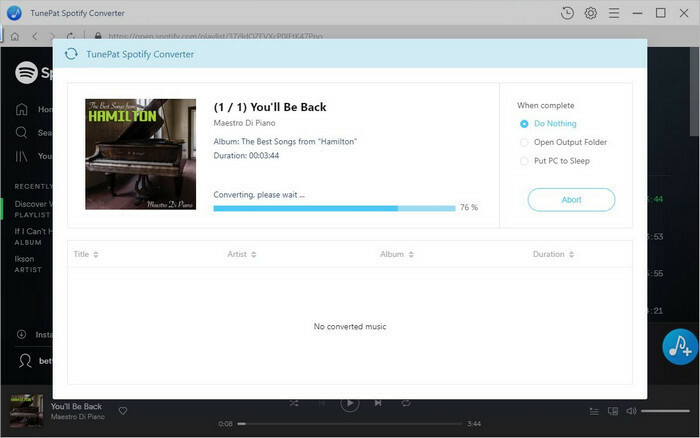 Click on Convert button to start converting the Spotify songs to MP3 process. After the conversion completed, you can click on History icon to find the well converted music. Note: The free trial version of TunePat Spotify Converter enables us to convert the first 3-minute file for each audio file and convert 3 music files at a time, you can unlock the time limitation by purchasing the full version.